Ready for something that no one else is? 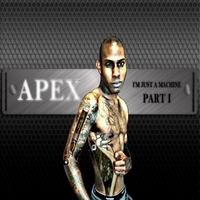 Then prepare yourself for Apex's I'm Just A Machine. Beats and lyrics that will leave you stunned. It has been a long time coming for I'm Just A Machine. The wait is over and now Apex releases what everyone has been waiting for. I'm Just A Machine feature recording artist Peter Parkar from Psycho Astronauts, Morgan Wright, King Royalty, Mr Mel the Riddler from Apex Records and Tameka Alexander. Production comes from Debo and the Beats along with Apex him self and Johnny Storm from Apex Records. You get 15 solid tracks with hits like 5 mins, Do It Again, I'm Stupid, and more.